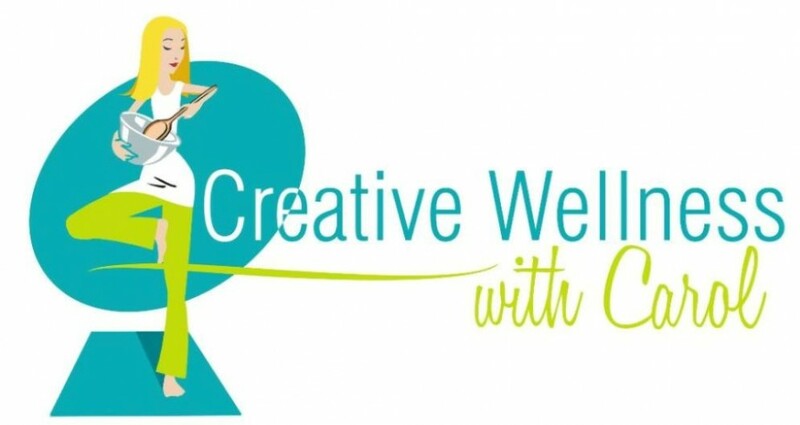 wellnessthymewithcarol | Come on, you know you want to! In case you missed it, we have re-branded as My Sage Gourmet. From classes and recipes to video how to’s and our product line of delicious organic herb blends- Let’s just say we have been very busy creating a beautiful healthy place to play. Come visit us soon! As the oldest of 5 children, I learned early on how to be both a cook and a nurturer. In a big family, there is always cooking to be done and my Mom was more than willing to hand off that “task” to me, especially after it was discovered that I happened to excel at it. I loved showing off my cooking skills and received lots of encouragement from my family even when I experimented and made mistakes! In addition to a passion for cooking, as a child I also appreciated the value of physical activity. We moved around a lot and I quickly figured out that the easiest way to fit in was through sports. I fell in love with softball and continued to play well into my 30s until a series of traumatic events suddenly left me incapacitated: unable to lift my left arm, experiencing terrible neck pain, severe migraines and inflammation in every joint in my body. The diagnosis: Fibromyalgia. At the time, Fibromyalgia was a relatively new condition for which, pre-Google, there were few resources available. The doctor who treated me provided no information, no hope for recovery and sent me home with a bag full of prescriptions that left me unable to stomach any food or water. When I called his office to report my adverse reaction to the medication, he refused to listen and I was ordered to continue the same course of action. It was a wake up call, and that’s when I decided it was time to take matters into my own hands. I threw the pills away and began to research everything I could on the subject of Fibromyalgia. The more I learned, the more I began to understand the importance of healthier life choices. Not only did I change the way I ate, I began practicing yoga for both stress release and muscle conditioning and I learned to let go of people and situations that didn’t serve me. At that point, food became not only a means of nourishment but a way of nurturing and respecting my body as well. I then began teaching cooking classes and became a yoga instructor so I could share with others what my journey had taught me. 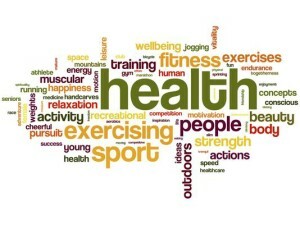 Eventually, I decided to expand my business to include Holistic Health Coaching. In 2012 I received my certification through theInstitute for Integrative Nutrition whose teachings reinforced my own belief that proper nutrition combined with physical activity, movement of any kind, is the best recipe for good health. 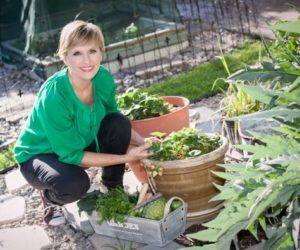 As a Health Coach, the one thing I quickly came to realize is that many people don’t cook for themselves and have never experienced freshly harvested food. They’re used to eating prepackaged food wrapped in plastic, foil or cardboard and many of those foods are masked with sauces, dressings or cheese to make up for the lack of freshness. Not to mention, they’re high in sodium, fat and artificial preservatives. When we view food as a gift from the earth, appreciating where it comes from, who is responsible for growing it, and how food varies from season to season, it all comes together. I have worked with hundreds of adults and children whose lives have been altered by their introduction to fresh food sources. The hands-on experience of food gardening or shopping at the local farmers market and purchasing produce direct from the farmers who grow it inspires a whole new relationship with the food we eat. For those who have never had the experience, freshly grown foods are a revelation. The same holds true for free range, grass fed, organic meats and poultry and wild-caught seafood. Not only are people impressed with the difference in taste, they are astounded by the substantial reduction to their food costs and the positive effect it has on their health and well-being. And the benefits don’t stop there. When people have positive learning experiences, they’re then inspired to pass on their knowledge and appreciation to family and friends. Then you have a domino effect, and when it comes to health, that’s the gift that keeps on giving. I love having a garden and it gives me a great sense of accomplishment. From the planting and caring of it, to reaping the harvest, I am happiest when I am up to my elbows in the bounty of homegrown goodness. Not only does my garden feed family and friends, it’s also a primary resource for my business. We use it for my cooking classes, and it provides the fresh ingredients necessary to make my herb salt line. Everything I need is right there at my fingertips! It also enables me to trace the origins of every single ingredient in my herb salts, from the heirloom and organic crops that seeded them to the organic soil in which they were grown. Beyond that, it’s rewarding to know that a little bit of me is going into my clients and into family kitchens all over the country. Wow, how cool is that? So, here I am, little ole’ me, finding a way to share my love for good health, fresh homegrown goodness and cooking with those I care for. I am one lucky girl. I invite you to explore the My Sage Gourmet web site where you will find lots of ways to nurture yourself and those you love, both inside and out. We’re back! The date is set and I’m excited! We’ve had much fun these past months putting in the new kitchen and installing the garden. 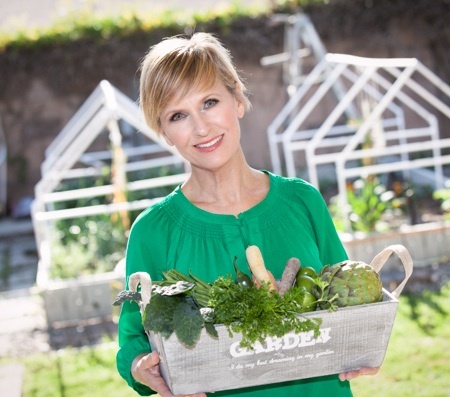 It’s been a beautiful experience to see everything taking shape, and I can’t wait to share my love of delicious garden fresh food with you. Join us as we prepare garden-inspired quick and healthy meals with a little decadence thrown in for good measure. We’ll have a great time preparing a communal meal, and everything will be made from scratch. While we’re cooking, I’ll share healthy cooking tips with you, including the nutritional benefits of each ingredient. Classes are taught in the My Sage Gourmet Kitchen. Please wear comfortable shoes with closed toes as we do stand quite a bit. 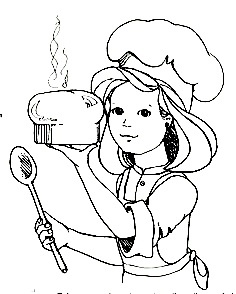 My Sage Gourmet provides the foods, menu, aprons needed for class. Buckwheat is not actually a grain although most people think it is. Which makes sense since it is often categorized in the grain group and used as a grain. Suprisingly it is a fruit . Because it is not a grain, it can be enjoyed by populations sensitive to wheat and other grains, including those with celiac disease. One method of eating buckwheat is in the form of noodles, similar to spaghetti. These noodles are sometimes called “soba noodles” and are popular in Asian dishes, although you can also use them to replace spaghetti in Italian dishes. 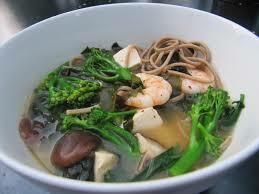 Fat and Calories A 3.5 oz serving of buckwheat noodles contains 360 calories, which is close to being considered high. A high level of calories is 400 by FDA guidelines. However, buckwheat noodles are low in fat, with 4 percent daily value (DV) of fat and 0 g saturated fat. At 3 percent DV sodium, they are also a low-sodium food. By FDA guidelines, 5 percent or less daily value percentage is considered low; 20 percent or more is high. Medicinal uses Buckwheat contains a glycoside called rutin, a medicinal chemical that strengthens capillary walls. One clinical study showed mixed results in the treatment of chronic venous insufficiency. Dried buckwheat leaves for tea were manufactured in Europe under the brand name “Fagorutin”. A buckwheat protein has been found to bind cholesterol tightly. It is being studied for reducing plasma cholesterol in people with hyperlipidemia. Nutrients Buckwheat noodles contain high levels of healthy nutrients. Buckwheat noodles contain 22 percent DV carbohydrates, 4 percent fiber and 28 percent protein, so these noodles pack a lot of energy. Compared to wheat, buckwheat contains more of the amino acid lysine and vitamin E, although it has less fiber than wheat. Antioxidants G.E. Inglett found high levels of antioxidants, phenolic compounds and flavonoids in buckwheat flour. According to this study, buckwheat beat oats and barley in phenolic compound amounts by two to five times and contains two to seven times more antioxidants than oats and barley. Benefits Buckwheat might be a viable option for people with celiac disease, who cannot consume grains such as wheat and rye, Donald D. Kasarda from the USDA explains. Buckwheat has significantly lower levels of gluten, which individuals with celiac disease are intolerant to, than wheat. Buckwheat also shows possibility for diabetics. A 2009 Russian study, conducted by Kh. Kh. Sharafetdinov and colleagues, and reported by the Food and Agriculture Organization of the United Nations, studied different types of grains and how they affected diabetics. The researchers recommended products made with buckwheat flour for diabetics after the study showed foods with buckwheat caused one of the lowest sugar increases and had one of the lowest glycemic levels out of all foods in the study. Beer In recent years, buckwheat has been used as a substitute for other grains in gluten-free beer. Everything about My Sage Gourmet is intended to nurture and support you to thrive in every sense of the word. From the Kitchen Coaching, and my artisan kitchen blends to Nutrition Consulting, and the Tone and Sculpt Yoga and weight loss programs, My Sage Gourmet is here to support you! As a Nutrition Consultant, I help men and women reconnect with their essential selves-the ground zero of who they are. No more putting their physical health and emotional well being on the back burner. As the mind shifts, eating becomes intuitive; movement becomes more gratifying as the body responds to the shift in perspective. Life becomes more joyful and bright! Connect with me for a complimentary discovery session! If you are looking for a fruit that is power packed, densely concentrated with a variety of nutrients, maybe its time to rethink the avocado. 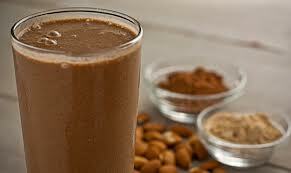 Checkout my delish recipe for your new favorite Avocado Chocolate Smoothie below! Avocado has sometimes received a “bad rap” as a vegetable too high in fat. While it is true that avocado is a high-fat food (about 85% of its calories come from fat), the fat contained in avocado is unusual and provides research-based health benefits. The unusual nature of avocado fat is threefold. 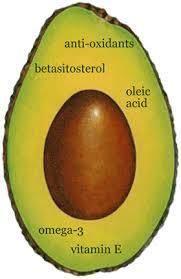 First are the phytosterols that account for a major portion of avocado fats. These phytosterols include beta-sitosterol, campesterol, and stigmasterol and they are key supporters of our inflammatory system that help keep inflammation under control. The anti-inflammatory benefits of these avocado fats are particularly well-documented with problems involving arthritis. Second are avocado’s polyhydroxylated fatty alcohols (PFAs). PFAs are widely present in ocean plants but fairly unique among land plants—making the avocado tree (and its fruit) unusual in this regard. Nutrient DRI/DV: pantothenic acid- 41.6%, fiber- 40.2%, vitamin K-35%, copper- 31.1%, folate- 30.3%, vitamin B6- 22.9%, potassium- 20.7%, vitamin E- 20.7%, and vitamin C – 20%. The Skinny: I know you have heard it over and over, “Eat your vegetables, they are good for you” Still, some folks try as they might , can’t seem to get past the basic salad or a couple of broccoli stems before calling the it quits… I am here today to ask you to take another look at Cauliflower. Perhaps after reading this you will have a new perspective on this deliciously healthy sweetheart of the veggie world. In a large heavy pot over medium heat, melt ½ stick of butter and 2 tablespoons olive oil. Add onions, Carol’s herb de provence or sea salt and cook until translucent, about 3 minutes. Add the carrots and celery and cook for a 5-10 minutes or until tender. Add the cauliflower, stir to coat, cover and cook over very low heat for 5 minutes. Add the parsley, water and bouillon then simmer for 10 minutes or until all vegetables are tender. Do not drain. Allow to cool a few minutes, ladle into a blender or food processor, cover and blend until uniform creamy consistency.-DO NOT OVERFILL BLENDER!!! Whisk 1-3/4 cups of flour into the butter until a thick, rough paste forms. Whisk constantly while it bubbles over medium heat. As it cooks, the roux will become smooth and begin to thin. Add black pepper & nutmeg. Stir gently to combine, and then serve immediately with warm rolls and an appetite for something wonderful. You will love everything about this. Add ons: tastes great with a little lemon peel grated on top if you like a really lemon flavor and scent as I do. Totally Optionals- Feeling a little decedent? If so, you may wish to add one of the following: Stir in a bit of heavy cream; heat but do not boil. Or a dollop of sour cream on top. Or a lovely grated cheese or croutons. Note-I use an immersion blender right in the pot, the only difference is you would then need to use the second pot of the next step and reverse which gets poured into which-No big deal but a thought to consider. Simmer an additional 10 minutes after pureeing if you go this route. Cauliflower, It’s the Real Deal! I know you have heard it over and over, “Eat your vegetables, they are good for you” Still, some folks try as they might , can’t seem to get past the basic salad or a couple of broccoli stems before calling the it quits… I am here today to ask you to take another look at Cauliflower. Perhaps after reading this you will have a new prospective on this deliciously healthy sweetheart of the veggie world. Of course I included a link to an easy, quick recipe that is inexpensive, makes a good size batch and it tastes delish! Now let’s move on to the real deal about Cauliflower. Cauliflower is one of several vegetables in the species Brassica oleracea, in the family Brassicaceae. 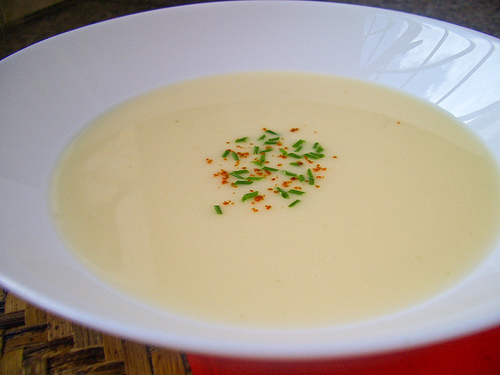 Typically, only the head (the white curd) is eaten, although the leaves are also edible and deliciously mild. Its name is from Latin caulis (cabbage) and flower. While cauliflower is not a well-studied cruciferous vegetable from a health standpoint, you will find several dozen studies linking cauliflower-containing diets to cancer prevention, particularly with respect to the following types of cancer: bladder cancer, breast cancer, colon cancer, prostate cancer, and ovarian cancer. This connection between cauliflower and cancer prevention should not be surprising, since cauliflower provides special nutrient support for the body systems. Chronic imbalances in any of the body’s systems can increase risk of cancer, and when imbalances in all three systems occur simultaneously, the risk of cancer increases significantly. Keep in mind that these cancer prevention studies are still in their infancy, however show great promise. Another reason to show a little love to Cauliflower: Scientists have not always regarded cardiovascular problems as having a central inflammatory component. However what is clear is the role of unwanted inflammation in creating problems for the blood vessels and circulation. The anti-inflammatory support provided by cauliflower makes it a food also capable of providing cardiovascular benefits. Of particular interest is its glucoraphanin content. Glucoraphanin is a glucosinolate that can be converted into the isothiocyanate (ITC) sulforaphane. Not only does sulforaphane trigger anti-inflammatory activity in our cardiovascular system—it may also be able to help prevent and has the potential to assist in the reversal of blood vessel damage. The fiber content of cauliflower—over 9 grams in every 100 calories—makes this cruciferous vegetable a great choice for digestive system support. 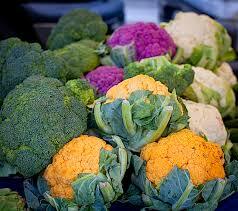 Yet the fiber content of cauliflower is only one of its digestive support mechanisms. Researchers have determined that the sulforaphane made from a glucosinolate in cauliflower (glucoraphanin) can help protect the lining of your stomach. Sulforaphane provides you with this health benefit by preventing bacterial overgrowth of Helicobacter pylori in your stomach or too much clinging by this bacterium to your stomach wall. Cauliflower can be roasted, boiled, fried, steamed, or eaten raw. Steaming or microwaving better preserves anticancer compounds than boiling. When cooking, the outer leaves and thick stalks are removed, leaving only the florets. The leaves are also edible, but are most often discarded. The florets should be broken into similar-sized pieces so they are cooked evenly. After eight minutes of steaming, or five minutes of boiling, the florets should be soft, but not mushy (depending on size). Stirring while cooking can break the florets into smaller, uneven pieces.